Everyone wants to hit the ball farther. If you mention the name Bubba Watson, avid fans often don’t know him for his putting ability, but rather as a long-hitting lefty with an unusual affinity for the color pink. 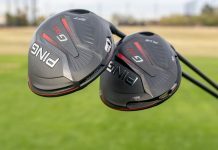 Manufacturers come out with new drivers every season touting more distance than its predecessor to quench the market’s thirst for that extra distance. 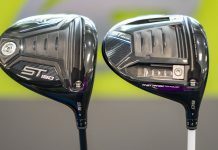 Sometimes there actually are innovations in materials used or in manufacturing processes to improve performance, like Callaway’s R•MOTO technology reducing face weight for a higher MOI in the XR Driver. However, the real secret to maximizing yardage is to ensure that your driver is the right one that fits your swing. To be more specific, you must find a driver that matches both the center of gravity (CG) in the clubhead and loft to your swing’s angle of attack and clubpath. A low CG works best for a player who hits down on the ball (a negative angle of attack). This player often display a clubpath that ranges from out-to-in to neutral. A high CG works for a player that hits up on the ball (a positive angle of attack). This player will often display a clubpath that ranges from neutral to in-to-out. These rules give us clubfitters a starting point to finding the right driver setup for golfers, but there are always exceptions to the rules. Impact location, clubhead loft (stated loft on head and effective loft at impact), clubpath (degree of in-to-out vs. out-to-in), hand/body actions, and shaft weight/flex/kick point can create variability from player to player. 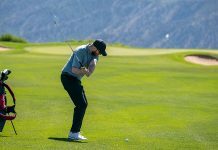 These rules usually dictate that a player with a positive angle of attack will hit the ball farther than a player producing a negative angle of attack. This is due to improved compression of the ball, lower backspin, and a higher launch angle, all of which are good things. From 2002 through late 2013 club manufacturers focused largely on providing increased distance on a mishit shot by providing greater carry. 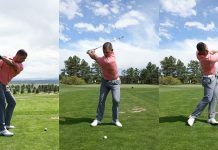 Heads with low/back CGs hit the ball high, provide lots of carry distance and reduce twisting on off-center hits to ensure that the fairway is found. Driver heads like Callaway’s FT-I, Ping’s G15, or Nike’s SUMO come to mind in this category. Conversely, players who hit up on the ball do not need help with launching the ball higher as they naturally hit higher shots. High/forward CG heads decrease launch but increase spin numbers to provide distance. TaylorMade’s R5 series and Titleist’s 905 fits firmly within this category. The reality in this scenario is that distance, while desired, was not something a player was achieving. These drivers were more likely to produce ballooning shots for the amateur golfer. With these old drivers, a player would have to purchase a lower lofted (i.e. 7.5-9*) driver to keep spin down within either high/forward or low/back CG heads. This is one of the only ways to produce a more penetrating flight, thereby creating longer tee shots. Any decent clubfitter will tell you that the backspin has to match launch parameters to produce maximum efficiency and distance. With the generalization from before regarding a positive angle of attack producing more distance than a negative angle of attack, how would a player with a negative angle of attack possibly be able to keep up with a player who hits up on the ball with a driver? Enter the TaylorMade SLDR in 2014. Taylormade started the ‘LOFT UP’ campaign. The average golfer had previously been accustomed to purchasing a driver with somewhere between 9-10.5º loft. Why would the average golfer now have to ‘LOFT UP’ to something with 12 or even 14 degrees of loft? The answer is because the low/forward CG drivers produce very low spinning shots, creating extra distance but lowering the launch angle too much. 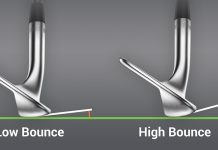 The average golfer hitting a low/forward CG driver with the same loft as they had used in a low/back CG will tend to launch it lower than would be ideal to produce maximum distance. As a result, the golfer needed a higher lofted driver to achieve the optimal launch angle. The low/forward CG characteristic in a driver is a very good ‘band-aid fix’ to someone who has a negative angle of attack. 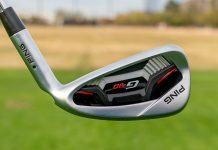 TaylorMade’s product was genius in design as it setup well for the average amateur golfer hitting a driver on the downswing with an out-to-in clubpath (causing the dreaded slice). There is a downside to this low/forward CG, though. It is less resistant to twisting, and it is more likely to lose ball speed on off-center hits. Most manufacturers now have some response to TaylorMade’s SLDR, like Callaway’s Big Bertha with the Gravity-Core. 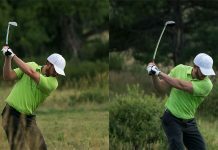 Keep in mind that there are a lot of generalizations in this article and many other factors influence the proper driver you should play. Shaft weight can influence club path and angle of attack. Shaft flex and profile can influence effective loft at impact. It has also been argued that finding the properly fit shaft is a more important vehicle for producing good results. The reality is that the clubhead is very important in producing good launch numbers on a vertical axis. 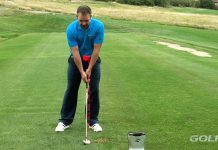 Sometimes people give up yardage to produce more accuracy, which is completely acceptable as golf is ultimately a game of producing the lowest score possible. The other reality is that it might be necessary to make swing changes to accomplish your distance or accuracy goals with the ‘big stick’. 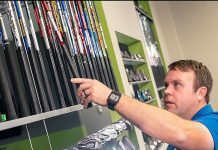 Talk to your nearest GolfTEC Coach to see to see if changes to your clubpath, angle of attack, or driver would help you play better golf! Brendan Gorman is the Center Manager & Certified Personal Coach at GolfTEC Englewood in New Jersey. He has taught over 3,000 lessons with GolfTEC and completed over 1,100 equipment fittings as a certified club fitter with 5 different club manufacturers.